The Google Teacher Academy. A Google Certified Teacher. Wow. I've been a teacher for 17 years now. I have a BA (Drama), an MA (Theatre Directing), and, of course, the Single Subject teaching credential (in English... hmmmm... what's wrong with this picture?) that allows me to teach high school students. I'm pretty proud of my two degrees but I've got to say... I tend to hide the name of the college where I bought- ...uhh... EARNED my teaching credential. That's right. I'm near-embarrassed by my teaching certificate. There are several reasons for this (another blog post maybe? ), but frankly that's not the point. The point is that if I were a wee bit crazier - and single - I'd get a Google Certified Teacher badge tattoo. 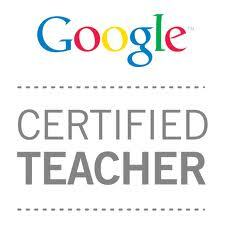 I've had several colleagues ask how to become a Google Certified Teacher. First of all, I'd search "Google Teacher Academy" and "Google Certified Teacher" to find a wealth of reflective blogs that are much better written than this one. 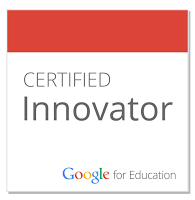 Then you can start at the very beginning: the official Google Teacher Academy page. After that, be sure to add +Google in Education to your Google+ circles so that their announcements will show up in your stream. Then you apply. And apply. And apply. The application itself is pretty straightforward. You'll want to check it out early and write up all your responses in a document you can save. The fun (read "ambiguous") part is the video. The video is on one of three topics. I chose "Classroom Innovation" for all of my entries. I applied four times but got in on my third. Sort of. It's obvious what the problem is here: it's all about me. Lesson learned. I LOVE this video. It took forever to make and I had to root my Galaxy Note to do it. It shows of student work. See? I learned. Any time I get to learn a new skill (like screencasting on a phone) while completing a task, I feel like I've moved forward. Different lesson learned. I'm going to pretend that I didn't get in with this one because of the music. It came up in YouTube as something that I had permission to use, but it's entirely possible that it didn't meet the guidelines about type of music used. Or it could just not be what they were looking for. Feel free to leave a comment with your thoughts. I applied for the Mountain View cohort, which would have been very nice because it's within driving distance from where I live, but the application was due during a super-busy time of my year. I missed the deadline by seconds. Literally. My computer clock that syncs from the internet said that it was 12:00am PST. Seconds. The funny part here is that I used everything word for word - even the same video - for the next application: Chicago. After spending so much time on that last one, I cranked this one out. Just me talking about my take on innovation in the classroom, some pics and boom. Not even the full minute. Lesson learned.